Yesterday afternoon my phone started beeping more than usual. I typically receive notifications when I get new emails, so I figured maybe I was just getting an extra batch of newsletters/daily deals/etc. I logged into my email to see that I had a new comment on one of my older blog posts. Okay, cool, nothing unusual. Then I received another comment. Then another. And another. It soon became relentless, with people “liking” my post, commenting and subscribing all at the same time. 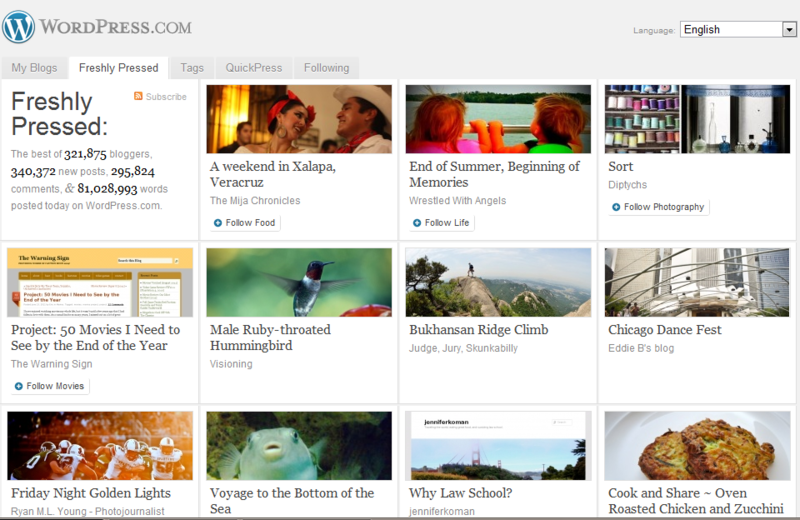 I couldn’t believe it, could WordPress really have marked my blog as Freshly Pressed? It’s been an awesome ride, to say the least. I hope to see an influx of regulars here, and hopefully create some great discussions along the way. Thanks to everyone who has stopped by, especially those who commented/liked/subscribed. You guys rock! So I was looking on WordPress.com and I saw your blog on the Freshly Pressed front page. I decided to check it out, and you really are a frequent and constant reviewer. Congratulations. I’ll deff be checking this blog out. Hey, thanks! Hope to see you around. i am new to blogging.. just my third day here.. saw ur post in freshly pressed…love the list! i’m a movie buff too.. and some of those on ur wishlist r my absolute favorites.. happy viewing and hope u keep getting “freshly pressed” ! good luck! You totally deserve to be on the Freshly Pressed,I love reading your blog! HAHAH That is brilliant matey. I totally made up for you!! You deserve the recognition! One regret about going self hosted is I miss the community of being PRESSED. I can never receive that amazing title! Thank you very much, Scott! I think the sense of community is the one thing that wordpress.com has over .org, although I do miss the flexibility I had before. Getting Freshly Pressed more than makes up for all of it, though. Agree completely with bohrium. Congratulations, you deserve the spotlight of being Pressed. Thank you, Gary! I appreciate the kind words, and all of the encouragement you have provided over the last few months. Thank you! It sounds like you have quite the ambitious project going on as well. Best of luck! Why thank you, kind sir! I really dig your blog as well. brilliant. i’m feeling the ripple effects myself from that post. no doubt about it being deserved, i always enjoy stopping by. Haha, yeah I have noticed quite a few people have been clicking through some of the links in my blogroll. Glad to hear you have been the recipient of new readers as well. Thanks for the kind words! Thank you! It’s crazy how much attention this blog is getting now, and there are no signs of it letting up either. Hope to see you around! you must be happy when you found your blog has been marked as Freshly Pressed! Yeah, it was definitely a nice surprise! Hello, I’m new to blog and i’m really convenience with wordpress…Nice blog bro…keep reviewing…and sharing.. Thank you! I should continue writing reviews for the foreseeable future. Congrats, maybe someday that’ll be me! Thanks! Keep it up, and it’s certainly possible. Congrats! I came here through FP, too, and love the list you’ve put together. My husband is a HUGE movie buff and I thought I was into movies before I met him, but I am weak on foreign films, too. Can’t wait to follow your blog and see what I’m missing and get input on where to go for the best movies. I can usually watch 1-3 movies a week, but we recently moved to Sicily, so our access is limited until we figure out what’s what, and I want to invest time in learning Italian, so I’m looking for either Italian movies or movies that have been dubbed in Italian (such as Il Grande Lebowski, which I bought in Italian). Thank you very much! That’s pretty awesome that you are learning Italian. I bet it would be fun to watch Il Grande Lebowski, haha. Good luck with your movie watching over there, and I hope to see you around! This is great! I’ve always wanted to know this so thanks for sharing : ) You have a great blog! Congrats on getting freshly pressed! I really enjoy your movie reviews. Thank you, John! I dig your blog as well. That’s a huge increase in stats. It was a great idea and a great post as well. Congratulations. Congrats man! I’m still hoping one day WP will pick mine out of the blue 😀 That’s gotta be exciting to get so many comments, I know that is what makes the blogging world goes around. Thanks! I’m sure you will be on there someday — you post awesome content every day!